A lot of golfers struggle to hit their golf driver as well as their irons. If that’s your situation then you’ll want to read this entire article now to find out what you can do to fix this problem. Because you’ll enjoy playing golf so much more when you hit your golf driver like you know you should. The first thing we’re going to look at to help you hit your golf driver better is your equipment. The major aspect that determines how well you will hit your golf driver is the shaft. If the shaft of your golf driver is not suited to you then you’ll struggle to hit that club very well. So if you hit your irons reasonably well but you struggle with your golf driver then the first question you must ask yourself is whether the shaft in your driver is the same as the shafts in your irons. If it’s not then that’s probably a major reason why you can hit your irons a lot better than your driver. Sadly a lot of golfers think that ‘regular’ in one shaft brand is the same as ‘regular’ in another shaft brand. So if you’re thinking that this doesn’t apply to you because you have a regular shaft in your irons and a regular shaft in your driver…you are sadly mistaken. When I’m asking whether the shafts are the same I mean exactly the same brand with exactly the same flex. Don’t ever assume that having the same shaft flex from two different companies means you essentially have the same shaft. There are no standards for golf shafts. So the first step you should take to hit your driver better is to get the exact same shaft that is in your irons put into your driver. If you try that I can almost guarantee that you’ll start hitting your golf driver better almost straight away. But even if you don’t it’s a cheap thing to try. 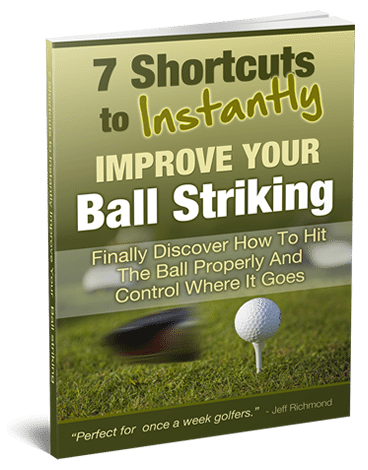 Now here are some more tips to help you hit your golf driver better. Tip #1: If your bad shot with a driver is a slice then you should tee the ball higher, as this helps to promote a draw. Conversely, if your problem shot with a driver is a hook you should tee the ball lower. Tip #2: Before teeing off the first tee you should always warm up for at least 5 minutes first. The golf swing is a very tough motion on the body and should only be performed when you’re warm. Not to mention that studies have shown that by warming up properly before teeing off you’ll hit the ball about 10 yards further than you would if you didn’t warm up. Tip #3: Tee the ball up on the side of the tee box to allow for the shape of shot you normally hit. Also, try to tee up your ball on the same side as the trouble and aim away from it. Tip #4: Get a shorter shaft put in your driver to give you more control, e.g. 43 inches rather than the usual 45 inches or so. Tip #5: Don’t be afraid to try a 12 degree driver to see if you get more control off the tee. Remember, the higher the loft on a driver the less it will curve. You may lose a fraction of distance over a lower lofted driver if you hit them both perfectly, but overall you’ll probably get longer drives more consistently with the higher lofted driver. 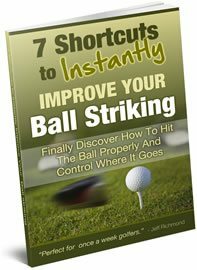 So there you go, try these tips to help you hit your golf driver better and I’m sure you’ll be hitting better golf drives in no time.